If you install a device box in a ceiling, can you mount anything to it other than a blank faceplate? The National Electrical Manufacturers Association (NEMA) for the 2005 NEC is attempting to clarify that you can mount a “device, smoke detector, carbon monoxide detector, or similar product” to a device box in a ceiling, as long as it does not weigh over 3 kg (6 lb). The comments from the NEMA representative and subsequent comments from contractor members of the panel (at the January meeting just concluded) suggest that large numbers of inspectors are saying no to this practice. In fact, however, the NEC does allow this equipment to be mounted to ceiling-mounted device boxes. By device boxes, this magazine article is referring to the rectangular steel boxes denominated as such in Table 314.16(A) and their nonmetallic counterparts, as shown in (figure 1). Be careful not to misapply the limitations in 314.27(A) for luminaires (lighting fixtures). This subsection generally requires that outlet boxes serving outlets “”used exclusively for lighting”” [emphasis supplied] be designed so a luminaire may be installed. 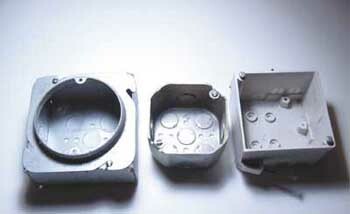 Outlet boxes meeting this requirement include the larger round or square varieties, such as 100 mm (4 in.) octagonal or square boxes, or their nonmetallic equivalents (see figure 2). These boxes employ 8-32 screws, and are presumed capable of directly supporting luminaires up to 23 kg (50 lb) with even heavier weights allowable if the box has been so listed. The source of confusion. The “designed for [lighting]” rule has been in the NEC for over fifty years essentially without change. The exception that follows this rule, however, is new with the 1999 NEC. The exception now allows other boxes, including device boxes and plaster rings with device-box drillings, to support luminaires up to 3 kg (6 lb). The exception specifically recognizes the smaller 6-32 screws used for device support, and goes on to include a restriction on its use to wall-mounted boxes. This orientation limitation means the mounting screws will be in shear as opposed to being in tension while in use. The misapplication of this exception beyond its scope is undoubtedly behind the objections to the use of ceiling-mounted device boxes for non-lighting applications. How to read an exception, I. The NEC has the force of law in most jurisdictions, and that means that its provisions need to be applied with great care and discipline. The scope of an exception must never be interpreted to exceed the scope of the rule to which it takes exception. Not only does this exception on its own terms refer only to luminaires, as previously noted the parent rule contains an express limitation on its applicability to cases where lighting is the only function of the outlet. That limitation also governs 314.27(A) Exception. Some may argue that even though the limitations in 314.27(A) Exception do not strictly apply to any other equipment, weight is weight and the limitations should be applied generically. This would be an oversimplification. Luminaires often come in sizes that multiply the affects of weight alone through leverage. Luminaires are also a source of some heat, which, particularly in the case of nonmetallic boxes, may impact the ability of the box to retain a screw when it is in tension. Furthermore, the weight of most devices is plainly inconsequential and they have been installed safely in ceilings for generations. There was never any serious discussion within CMP-9 of imposing this limitation to devices. Utilization equipment, however, is a more interesting question. In some cases it could present similar issues as luminaires bring to the table (or attach to the ceiling). CMP-9 should address this, but until it does, installers and inspectors will have to rely on any mounting restrictions contained within the installation instructions for the product involved. Figure 3 illustrates the three possibilities for device boxes as presently covered in the NEC. Smoke, heat, or CO detectors are certainly acceptable where mounted to device boxes in a ceiling. The 1999 NEC exception to then 370-27(a) was solely intended to relax the conventional outlet box rule to cover the thousands of applications in routine use. The 3 kg (6 lb) limitation was inspired by 410.15(A), which uses that limit on luminaires supported by the screw shell of a lampholder. If an Edison-base lampholder could support a luminaire from the screw shell alone, then surely two 6-32 steel screws could do the same. The proposal submitter (this author) never imagined that this specific weight limit would actually make it into the NEC. The idea was to use this limit as a placeholder, and surely UL, NEMA, or some other major player would come back in the comment period with a better-substantiated weight limit. In due time, UL backed off within a year and reiterated the 3 kg (6 lb) limit, but the 7 kg (15 lb) concept never completely went away. It came back as a proposal (from this author based on the UL publication) for the 2002 NEC, which CMP-9 initially accepted. NEMA stepped forward, however, during the comment period with strong objections based on perceived inadequacies of the UL testing procedures. Now CMP-9 backed off and let the weight limit and orientation restriction from the 1999 NEC stand. The result is that a weight limit that was never originally intended to be taken very seriously is now midway through its second code cycle. There are no proposals to alter the 3 kg (6 lb) limit, so it looks like this is safe for its third code cycle. 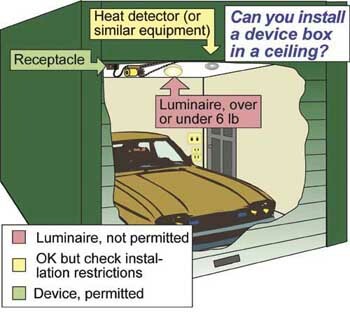 That leaves the NEMA proposal (and another similar one) to recognize ceiling-mounted device boxes for small utilization equipment. CMP-9 rejected this proposal at its recent meeting, not because it opposes the suggested uses, but because it is unnecessary. 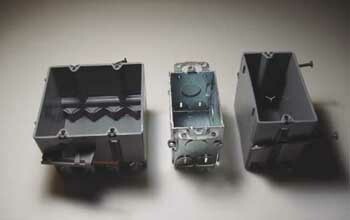 Nothing in the NEC now limits using device boxes in ceilings for use with other than luminaires. Note also that a receptacle could be installed in one of these locations by right, and the pullout force to remove a plug often exceeds the 6 lb limitation. NEMA and UL should come to some agreement on a testing protocol, and then come back to CMP-9 with a better-substantiated limitation. Ideally this limitation should also address the broader question of utilization equipment, and not just luminaires. Any prohibition against the thoroughly innocuous examples cited in the NEMA proposal would be unlikely. CMP-9 also requested NFPA staff include coverage of this issue in the next NEC Handbook, and that may result in more consistent enforcement. Do Stacked AFCIs Cause Panelboards to Overheat?